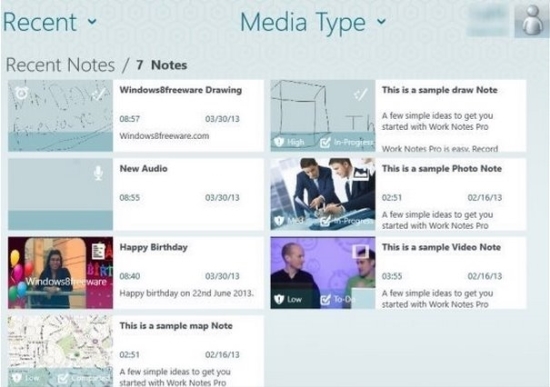 Here is a list of 4 Free Windows 8 Notepad apps. These Notepad apps are very useful in taking down notes on your Windows 8 PC. With these apps, you can easily create, edit, and save multiple notes. Some of these apps are simple and serve the primary purpose of creating and saving notes, while some have advanced features like ability to make online search and translations, creating notes of different types such as text, audio, map, etc. Memo Stick and Tu Tu Note apps are available under Productivity category of Windows Store. NoteDown app is available under Tools category of Windows Store while you will get Work Notes Pro under Business category. Let’s have a quick look at each of these Notepad apps. 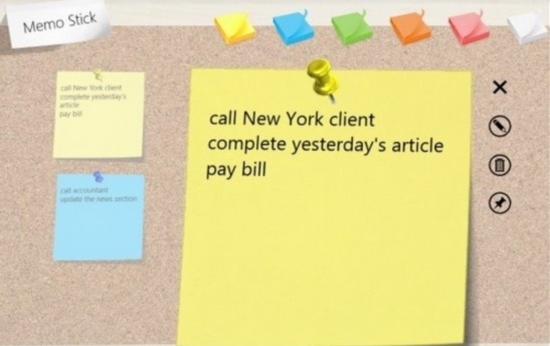 Memo Stick is a Free Windows 8 Notepad app that lets you pin your important notes to your Start screen. It is a simple Notepad app having various text editing options. You can create multiple notes, save them, edit or delete them anytime. The app’s interface also looks quite simplified and minimalistic. On the main screen of the app itself, you will get six different colors of notepads to choose from and make your notes. Pinning to Start screen feature of this app adds to its functionality. Click here to get Memo Stick. Tu Tu Note is a Free Windows 8 Notepad app that lets you write notes in your own handwriting. With this free Windows 8 Notepad app, you don’t require a keyboard to type your notes. Instead you can write notes or draw using your mouse or by touch. The tile-based interface neatly organise your notes on the screen. So, you can easily select and read from multiple notes prepared in the app. You can also mark your important notes with different colors. For this purpose, three different colors – Red, Blue, and Black are provided in the app. Additionally, it offers an eraser to erase any unwanted or mis-written notes. Click here to get Tu Tu Notes. NoteDown is a feature-rich Windows 8 Notepad app available freely in Windows Store. With this Free Windows 8 Notepad app, you can easily create, open, edit, save or share notes in form of text files. The app also allows a direct access to printer connected to your system. So, you can easily take print-outs of the documents. You can also search for a word in the document using Find option. It supports txt and rtf text file formats. Apart from having various text editing and text formatting options, this app also features some unique and useful functions. It enables you to make online searches and translations of a selected text in the document. On the other side, you can also connect to your local music library and listen to your favourite songs while using this app. The app allows you to access your music library straight from the app itself. Click here to get NoteDown. Work Notes Pro is another advanced Windows 8 Notepad app that lets you create and save notes in different types of formats. Using this Free Windows 8 Notepad app, you can make text notes, photo notes, audio notes, video notes, drawing notes, and map notes. Plus, you can view status of your notes in the form of a pie-chart. The pie-chart will display information about your completed, in-progress, and to-do tasks. The main interface categorises your notes into various types, thus making it convenient to sort and read notes. This Notepad app also has additional features like setting up reminder for a recorded task, its importance level and status, and much more. You can also add tags to your notes. The app also enables you to share these notes with other supported apps, Skydrive, Dropbox, Facebook, and Twitter. Click here to get Work Notes Pro. These were some of the useful Notepad apps we have found. Hope this review will help you get an idea of features of these apps. So, compare them and get the one that is best suited to you. Do share your experience via comments.